The final instalment of Robin Hobb’s Sunday Times best-selling series The Rain Wild Chronicles. Attacked by hunters, Tintaglia is dying of her wounds. If she perishes, her ancestral memories will die with her and the dragons in the ancient city of Kelsingra will lose the secret knowledge they need to survive. The dragon keepers immerse themselves in the dangerously addictive memory-stone records of the city in the hope of recovering the lost Elderling magic that once allowed humans and dragons to co-exist. This series is very enjoyable and has the same quality you expect from Robin Hobb. Some surprising twists, great linking into previous story lines from other books in the larger range of The Rainwilds series and story telling of vivid colour and fantastic lost world feel. If you loved the other books in the series, you'll love this one too. Love Robin Hobb"s books would love to see another after this. For over two months I have been caught up in Robin Hobb's enchanted world. Upon reflection I like Fitz and his story and world the best and look forward to now embarking on the final leg of this epic adventure with him and the Fool. I have enjoyed the adventure up the Rain Wild River and the coming of age of the dragons, their keepers and all those surrounding them. At times the story did drag on, well that is how it felt for me, and found it surprising how quickly it was all concluded. There were times when I felt that I may have been drowning in the story, or at least getting consumed by it, a little like how some of the characters found themselves being sucked into the memory stones. A great read none the less, well worth the time and emotional input for all those who love fantasy. 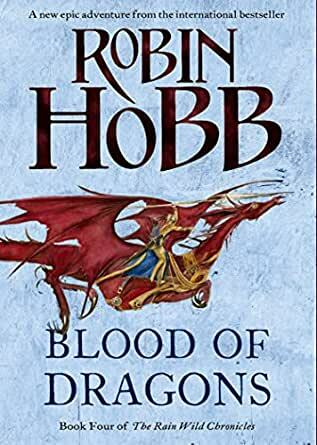 Was sad to finish this book as it is the last book in the series and the last book of Robin's that I had left to read.